This blog post focuses on an effective and versatile cosmetic dental procedure available at Gustafson Morningstar Dentistry in Royal Oak, porcelain veneers. Veneers are individual covers for the front part of teeth. They are a great way to correct a myriad of tooth imperfections such as chips, stains, yellowing, unattractive shape or minimal misalignment. Have you ever sought a minimally-invasive facelift for a tooth without getting an entire crown? Veneers are your solution! Durable, tooth-colored porcelain laminate is shaped into thin shells and custom-fitted for each patient’s unique set of teeth. The thickness, enamel color, alignment, and shape of your teeth affect the final result as well as whether you have any gum recession. Veneers are matched to your existing teeth so they will blend seamlessly, but if you are planning to treat several teeth, you definitely want to have them fabricated in the same “batch” at the lab. The first step in the veneer process is to make a model of your teeth to work from. After that, a dental technician uses the model to create the veneers to the precise size, shape, color, and extent of translucency. Many patients wonder if veneers are as durable as their natural teeth. Though the veneer tooth-prep process weakens the tooth very slightly, with proper care, veneers can last up to 15 years. If you are wondering whether porcelain veneers are the dental solution for you, schedule a consultation with Gustafson Morningstar Dentistry in Royal Oak. 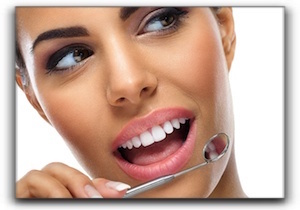 We offer our patients general and cosmetic dentistry. Make an appointment today.